We always start with Discovery, which seeks to provide clarity for you and us. Next, we Design a plan that meets your needs and objectives. Then, we Implement your plan of action. Lastly, we Manage and Monitor your plan, providing ongoing support. 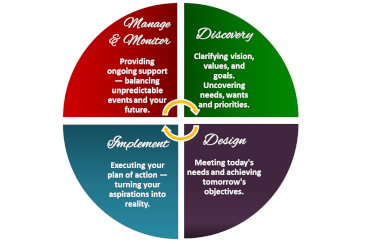 These four steps work together and allow adaptations of your plan to changes that inevitably occur as we move towards your goals.